Founded in 2004 in High Point, North Carolina, Bolier makes fine furniture inspired by traditional craft techniques, but with a modern, relaxed feel. Clean, crisp lines and a muted color palette feature throughout the brand’s collection, resulting in versatile pieces that lend understated elegance to a wide variety of spaces. 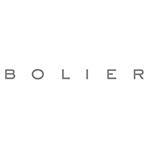 Bolier has a global presence with showrooms in New York, London, Paris, and Hong Kong, and is committed to eco-friendly manufacturing methods.